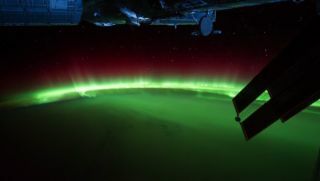 View of the Aurora Borealis from the ISS. The Earth is completing another trip around the sun, bringing 2011 to a close after a packed year of spectacular sights and mission successes, as well as some big disappointments. The Kepler space telescope has spied evidence of two Earth-sized worlds in a star system 950 light-years away. What a year it has been for science and astronomy. From the discoveries of potentially habitable alien planets to the detection of a tiny new moon around Pluto and jaw-dropping lunar and solar eclipses, astronomical research in 2011 has not only made extraordinary strides but also raised new and tantalizing questions for the future. Asteroids, comets, eclipses, eruptions and discoveries highlight a very active year in space. See some of the astronomical highlights that made 2011 a special year to peer into the cosmos. This year was quite an eventful one in spaceflight, with many vessels launching toward the heavens — and a few crashing back to Earth. Here's a rundown of the top 11 spaceflight stories of 2011, from the last mission of NASA's venerable space shuttle program to China's first-ever docking of two spaceships in Earth orbit. 2011 was a very eventful year in spaceflight. Vote for your favorite space mission of the year here. The space shuttle program is over, but that won't mean a lack of launches in 2012. See the rockets' REAL red glare here in these 11 space shots of the year by U.S. launch provider United Launch Alliance. Human spaceflight turned 50 this year, but 2011 was less about drawing inspiration from the past than about transitioning to an uncertain future. After five years of surprising quiet, the sun roared to life in 2011. Our star erupted with numerous strong flares and waves of charged particles. Many researchers predict the surge will culminate in a peak in the sun's 11-year activity cycle in 2013. The year 2011 saw the discovery of a bountiful crop of alien planets. Scientists discovered the darkest world, a diamond world, a new class of rogue worlds and more. Cast your vote for your favorite! It wasn't easy, but we pulled 50 of the most amazing views from space in 2011 for you to review. But which one is the best? Vote now and decide! On Dec. 21, 2012, many doomsday believers fear the apocalypse — anything from a rogue planet smashing into us to our world spinning end over end. However, the world should expect nothing more next year than the winter solstice, the longest night of the year, NASA says. As the year 2011 comes to a close, some might wonder what is looming sky-wise for 2012? What celestial events might we look forward to seeing? Here are 12 cosmic skywatching events not to miss in 2012.